Dr. Nancy O’Dell not only works at Akron Children’s Hospital, but also donates to the hospital to continue the legacy of her father who worked here for more than 40 years. 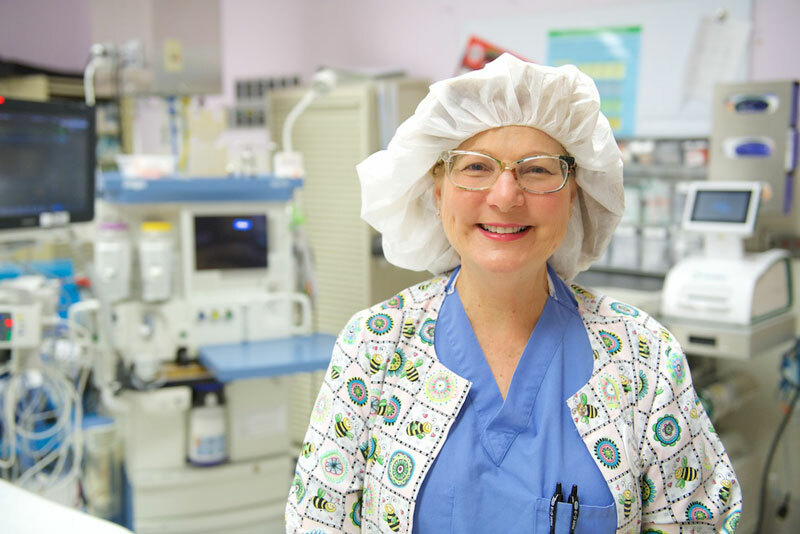 For pediatric anesthesiologist Dr. Nancy O’Dell, Akron Children’s Hospital has always been about family. Her father, Dr. Harry O’Dell, was an orthopedic surgeon who worked at the hospital for more than 40 years and served as chief of staff in 1972. Thirty years later, Dr. O’Dell returned to Akron to take a position at Akron Children’s and continue her father’s legacy. Dr. O’Dell grew up in Akron, surrounded by plaques and mementos from Akron Children’s and participated in the Charity Ball as a debutante when she was a teenager. At 30, she realized she wasn’t happy in her current job and her MBA program so she started taking pre-requisite classes for medical school at night. 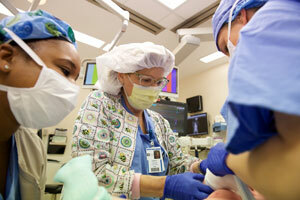 She decided to pursue medical school, originally planning to go into obstetrics and gynecology. Dr. O’Dell decided to pursue medical school at age 30 after she realized she wasn’t happy in her current job. Prior to her OBGYN rotation, Dr. O’Dell had done a pediatric rotation and swapped with a fellow student to do her anesthesia rotation at a pediatric hospital as well. She loved those rotations, so she scheduled as many pediatric rotations into her fourth year of medical school as possible. Her love of pediatrics led her to a pediatric anesthesiology fellowship at the Children’s Hospital of Philadelphia and eventually back to Akron. Not only did Dr. O’Dell’s passion for working with children inform her career choice, it’s also part of why she donates to Akron Children’s Hospital. “I chose pediatric anesthesiology because I love kids, so I also give to help the kids at Akron Children’s outside of what I do in my job,” Dr. O’Dell said. In addition to her love for helping children, Dr. O’Dell also gives because it’s important to her, as it was to her parents, to see Akron Children’s continue to grow. Dr. O’Dell says she loves looking at the hospital’s digital timeline display and seeing all the history around the hospital, especially because she’s known many of the people important to Akron Children’s her whole life. “We have to keep that history going and I want to help do that,” she said. 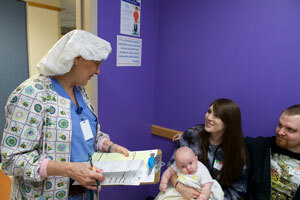 Dr. O’Dell originally set out to be an OBGYN, but discovered a love for pediatrics during rotations. In addition to being a pediatric anesthesiologist, Dr. O’Dell is also a United State Tennis Association doubles player and tries to spend her time away from the hospital on the tennis court. She also devotes time to serving on the board at Victory Gallop, a therapeutic and recreational horseback riding facility that is also home to Petie the Pony who visits Akron Children’s as a therapy pony. “I take pride in helping support Petie, who means so much to many of our patients and many of our patients also participate in programs at Victory Gallop,” Dr. O’Dell said. Akron Children’s deep-rooted involvement in the community is another reason why Dr. O’Dell chooses to donate to the hospital. For more information about how you can support Akron Children’s, call Luann Maynard, senior major gifts officer at the Akron Children’s Hospital Foundation, at 330-543-1302.